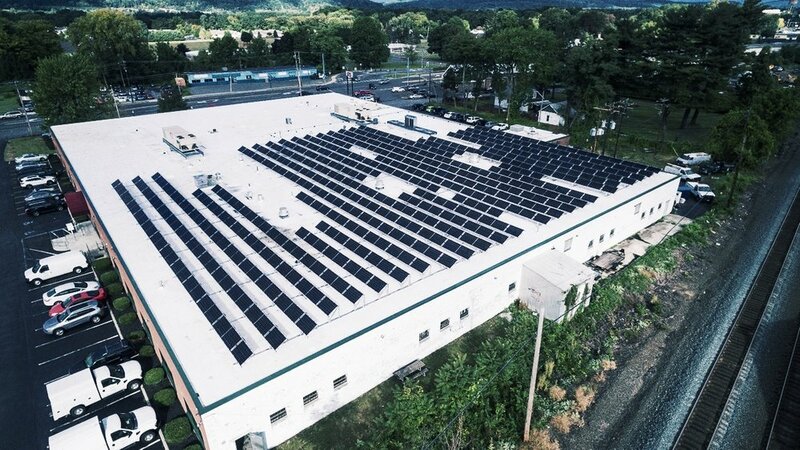 In October of 2016, a medium sized commercial installation of Prism Solar bifacial modules was commissioned in Kingston, NY and installed by Sunrise Solar Solutions; aerial images of the system can be seen in Figure 1. The major electrical components of the system are listed below in Table 1. Figure 1. Aerial views of the 532 module, 154.3kW (DC)/166.5kW (AC) bifacial system installation. Table 1. 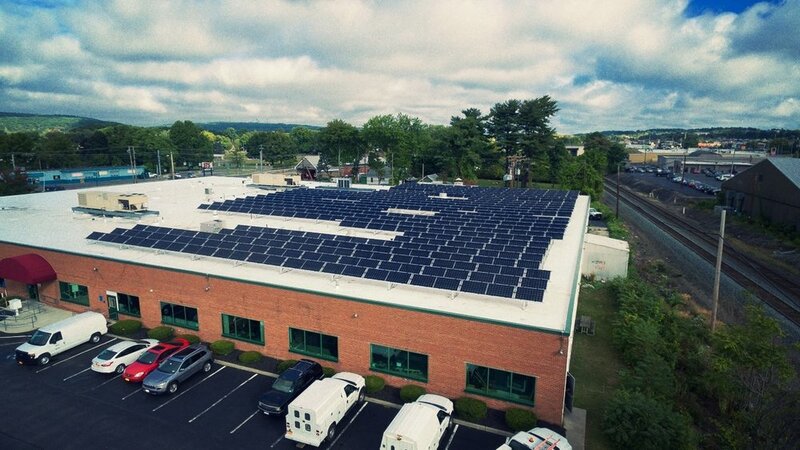 Major electrical components for the Kingston, NY bifacial installation. The system was installed over a high reflectance (+75%) roof membrane, which provides additional light to the rear of the bifacial module, increasing the energy yield of the system over what would be achieved on a traditional darker roof. The modules were tilted at 30 degrees, oriented to face south, and the racking itself was optimized to not shadow the rear of the modules and maximize the energy generation capability of the Prism Solar modules. Based on the modules and inverters, the system has a DC/AC ratio of 0.927. A DC/AC ratio under 1.15 is considered highly atypical in commercial applications, and values in the 1.15–1.30 have become standard in the PV industry. Traditional mono facial modules tend to operate well under their STC conditions, and therefore, the inverter can be sized under the DC module array nameplate. For monofacial PRs in the 0.77–0.85 range, the DC/AC ratio can generally be between 1.17–1.30. The bifacial system DC/AC ratio (0.927) was chosen purposely low so the inverter system would not be saturated or “clipped” under the high bifacial gain conditions expected in a white commercial rooftop, as seen in previous studies [Ref. 1–3]. The total design of the system was engineered so that the system would generate over 22% more annual energy than an equivalent STC-rated monofacial system, in other words, achieve a bifacial gain of over 22%. The system field performance was calculated based on the data collection systems offered by the SolarEdge system monitoring at the optimizer/inverter/system level. The performance ratio was also provided by the SolarEdge system once an irradiance measurement was added. The energy produced daily, since the system commissioning is shown in Figure 2, while the monthly energy is shown in Figure 3: full first annual energy generation was +1,650 kWh/kW range. Figure 2. Daily energy production in kWh/kW for the Kingston bifacial system. The winter weather variability can be seen in the daily peak-to-peak difference. As expected, daily energy production is minimized around the winter solstice. Due to the winter weather and snow, daily production often neared zero, but as seen in Figure 4, the system still had a high performance ratio. Figure 3. Monthly energy production in kWh/kW for the Kingston bifacial system. The system consisted of 532 of 290W bifacial modules yielding a 154.28kW module system. Figure 4. Daily energy production in kWh/kW (Blue) and the system calculated performance ratio (Orange). A 14-day moving average trend line (Dark Red) is used to illustrate seasonal change in performance ratio. Figure 4 shows the Energy collected per day in the familiar kWh/kW notation and the resultant performance ratio (PR) calculated by the SolarEdge system. The irradiance/performance ratio data collection was begun on the system on Feb 22, 2017. Table 2. PR for Differnet Time Periods. It must be noted that the system was regularly exposed to snow during the winter but continued to operate at high PR levels even when no snow was present. The system installer reported that the system was able to shed or melt the snow from the arrays very quickly, and that even when the front of the arrays were covered in snow, the system produced significant amounts of energy. The spring PR is seen to decline as summer approaches, as expected, since the modules operate more inefficiently as the ambient temperature increases. Based on bifacial energy simulation run on the system prior to installation, the annual PR of the system not accounting for snow accumulation was expected to be between 0.97 and 0.98. The median bifacial system PR for the period from Feb 22 to Nov 12 was 1.02. Based on a comparison of a standard monofacial annual PR of 0.77–0.90, and that of the bifacial systems’ median in the winter months of 1.24, the additional energy generated by the bifacial system can be estimated to be 37.77%–61.04% during the winter period. This large gain in winter has been previously shown in [Ref. 4], especially under snow conditions. For the total period of median recorded PR of 1.02, the gains can be estimated between 13.4% and 32.6%. The reader is reminded that this is a comparison of standard monofacial annual PR values against seasonal bifacial median values. Figure 5 shows the bifacial modules under snowy conditions, while Figure 6 shows the DC optimizer performance reported by the SolarEdge P730 optimizers. The P730 in the selected section reported peak DC power values in the range of 653.69W–704.44W for a sunny day in late march for optimizers connected to 2 modules; since each P730 optimizer is connected to two Bi60-368BSTC in series, it can then be inferred that each 290W (black background STC rated) module in the selected section was producing between 326.85W and 352.22W, which is 12.70% to 21.45% over their STC rated value. Figure 5. Bi60-368BSTC modules under snowy conditions on the white roof of the building; of interest is that even with significant amount of snow on the roof and behind the modules, no snow is present on the modules themselves. Figure 6. Peak DC performance reported by P730 SolarEdge DC optimizers for a highlighted portion of the array; there are two Bi60-368BSTC (290W STC) modules connected to each P730 DC optimizer. Figure 7. System and average module AC performance for Mar 22–23, 2017. The AC module performance for the entire system and the average per module AC performance, is shown in Figure 7. As is shown there, the system was bound by the AC output limit of the inverters, and “clipped” at the 166.5kW AC limit value early in March; this would indicate that under non-clipped conditions, the power/energy output of the system would be even higher. An optimized bifacial system was installed in New York State and operated under snowy/winter conditions for much of February and March of 2017; during those months, the overall system output and performance ratio of the system were seen to be operating at much higher values than those traditionally associated with PV systems, and was designed to generate +22% annual energy compared to an equally rated monofacial system/offering. Based on a Performance Ratio analysis of the seasonal measured bifacial values compared to typical annual monofacial values, the Prism Solar Bi60-368BSTC modules were collecting between 37.77%–61.04% more energy than what would be typically expected for an equivalent monofacial installation for the winter conditions, and between 11.11%–29.87% for the spring conditions. The median bifacial system performance ratio for the period Feb 22–Nov 12 was 1.02, the modeled annual value was between 0.97–0.98, not accounting for snow effects. Additionally, based on the field peak power performance of the modules, it was shown that the bifacial modules achieved peak power production that was 12.70% to 21.45% above their STC (black background) rating late in March; considering that most PV modules operate at 8%–15% below STC condition even at full illumination, this shows that the Prism Solar bifacial modules were receiving a direct bifacial power boost. This direct power boost, integrated over time, translates into the additional energy generated by bifacial systems. Both the PR and peak power metrics clearly indicate that the bifacial modules exceed the energy harvesting potential that would be expected from a traditional system.